Target killing in Karachi has once again got rapid. Recently assassination of sabeen Mahmud shocked whole nation. An assistant professor of Mass communication department in Karachi University was shot dead in Federal B area. Dr Syed Wahidur Rahman, also known as Yasir Rizvi, was an instructor at the Karachi University's Mass Communication department. He was killed when four unidentified attackers riding two motorcycles opened fire on his car. The assailants managed to flee the scene soon after the attack. 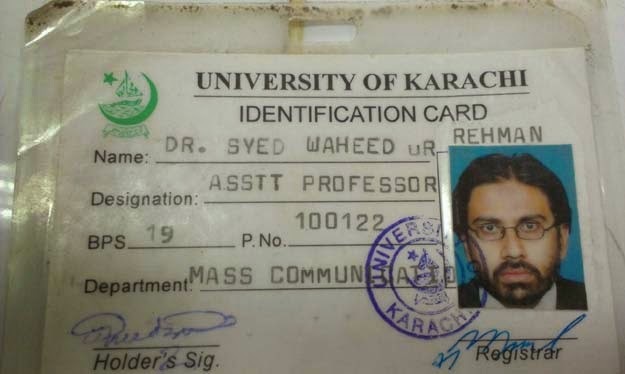 DIG West police Feroze Shah told Dawn.com that the slain professor belonged to the Shia community. Dr Rahman's body was taken to the Abbasi Shaheed Hospital in Karachi. Dr Rafia Taj, former chairperson of the Mass Communication department, told local media that the slain assistant professor was an active member of the faculty. Dr. Syed Waheedur Rehman did his doctorate from the Federal Urdu University and taught at the university before moving to Karachi University. A former student of the slain professor shed light on his teacher’s conduct and professional capacities. Describing him as a teacher who had hands-on experience of the subject he was teaching, Syed Wahidur Rehman reported for Ummat newspaper for 13 years. He served as Assitant Professor of Federal Urdu University for 6 years and since the past three years, he was responsible for coordinating and conducting all events at Karachi University. We cannot say that he has any link with the Baluchistan talk in Karachi University or he was killed for his Shiite belief. Every assumption will lead to more confusion so it’s too early for telling the reason behind his killing. The teachers and intellectuals feel unsafe in Khi and want government to take action against such brutal assassinations. Moreover, Professor Taqi Hadi and Dr. Javed Qazi two members of the faculty of a dental college lost their lives in the killing fields of Karachi.